It was snowing lightly here yesterday, a reminder that our outside season is over for another year. Our days inside are becoming a regular routine now. Homeschooling our older children plus twin toddlers means I need to embrace a more planned schedule. One of the ways I see this working for us, involves a regularly scheduled craft time beyond just pencils and paper. Today we did our first organized craft. It's a new medium for the boys and they are enamored. 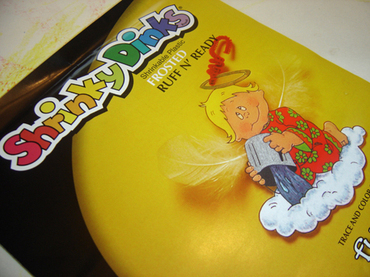 They started off with an original drawing, I guess we did have the pencils and paper out after all. 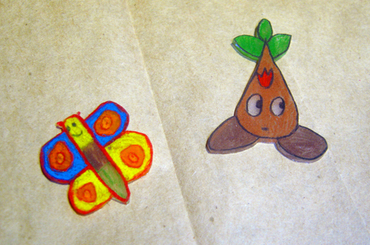 Transfered it from paper onto the fuzzy (sanded) side of the shrinky dink and then they proceeded to color it in. Next step is cutting it out. about choked on her tea until I explained it further. 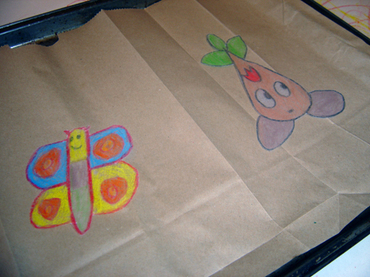 After the items are cut out, you place them on a piece of brown paper bag which is on a cookie sheet. Put them in the oven at 160 degrees C (325 F) for about 1-3 minutes. Ours took 1 1/2 minutes to shrink. Take them out to cool and press them lightly with a few sheets of paper to completely flatten them. They should shrink about 1/3 the size and be about 9 times thicker. Notice the colors become really vibrant and concentrated. 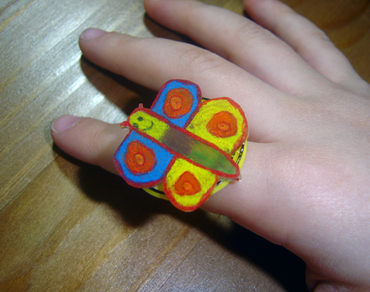 have his very own butterfly ring. 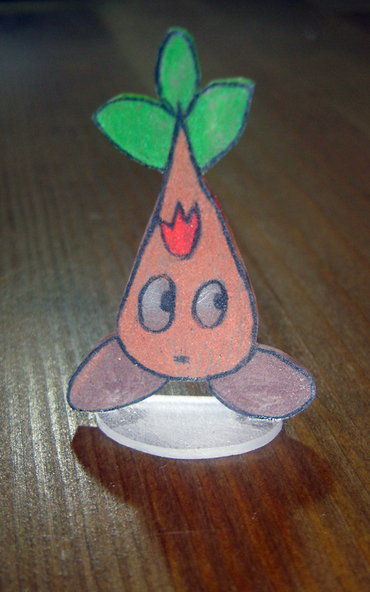 figurine by gluing his creation a "Sibleseed" onto a shrinky dink base.